How to prepare (healthy) sweet potato usili? Sweet potatoes are one of my favourites. There are so many reasons to love them – the first one being, well, they’re sweet. They’re rich in vitamins B6, D, and C.They are also rich in Iron and Magnesium. As a result, sweet potatoes can help you with anti-ageing, fighting cancer, strengthen bones, heart, teeth, nerves, and skin. And, even though sweet potatoes are sweet, you don’t have to be worried about the sugar levels. The natural sugars in sweet potato are released slowly into your bloodstream, so you don’t have to worry about sugar spikes! Alright, so here’s the recipe for sweet potato usili which goes nice as an evening snacks with coffee or tea! 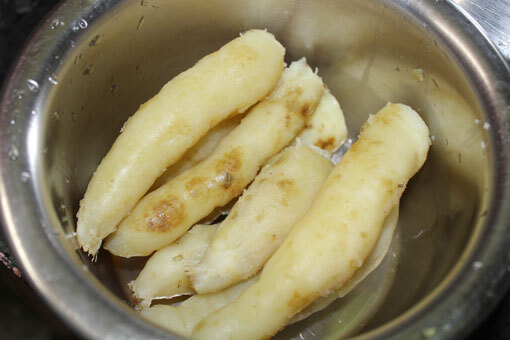 How to prepare sweet potato usili? Cook sweet potatoes either in a pressure cooker or a saucepan. 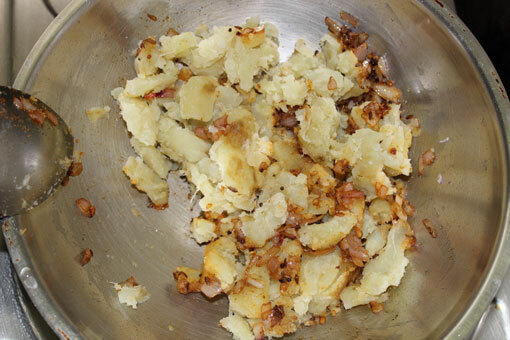 I found that the potatoes get mushy when I cook them in a pressure cooker. So I always put the potatoes in a saucepan (after cleaning them, of course! ), pour enough water to cover them, and cook them. I check often and when I find that the potato is cooked I switch off the flame. Once cooked, peel off the skin of the sweet potatoes and mash them. Keep aside. 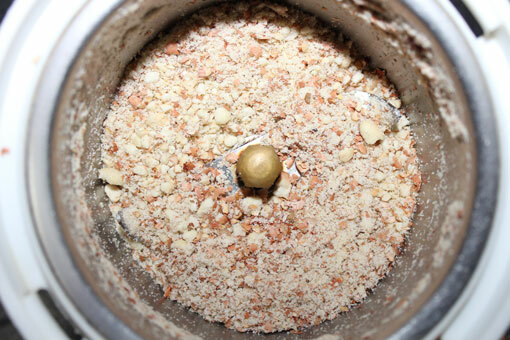 Put the roasted peanuts in a food processor and grind them to a coarse powder. Keep aside. In a kadai warm a tablespoon of oil (I used coconut oil) and add urad dal. Once it turns light brown, add cumin seeds and mustard seeds. 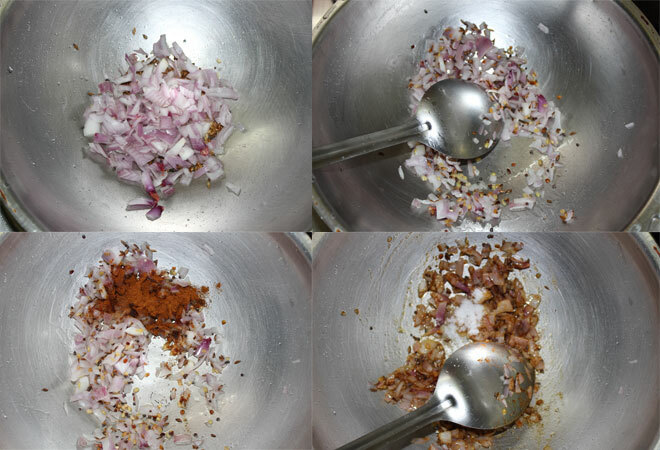 Once the seeds splutter, add the chopped onion. Fry for a minute. Add chilli powder and salt and fry for another minute. Once the onion turns translucent (not burned) add the sweet potato and mix well. Simmer. 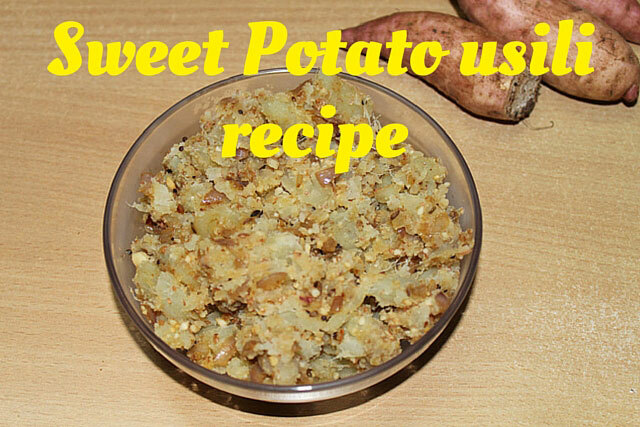 Make sure the onion and other ingredients are well blended with the sweet potato. Now add the coarsely ground peanut powder and mix well. Switch off the flame and serve with hot tea/coffee. 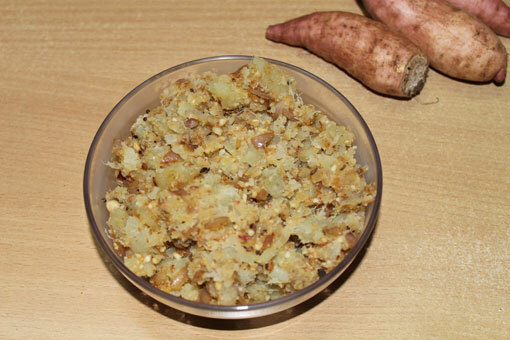 Sweet potato usili goes nicely as an evening snacks with coffee or tea! Cook sweet potatoes either in a pressure cooker or a saucepan. 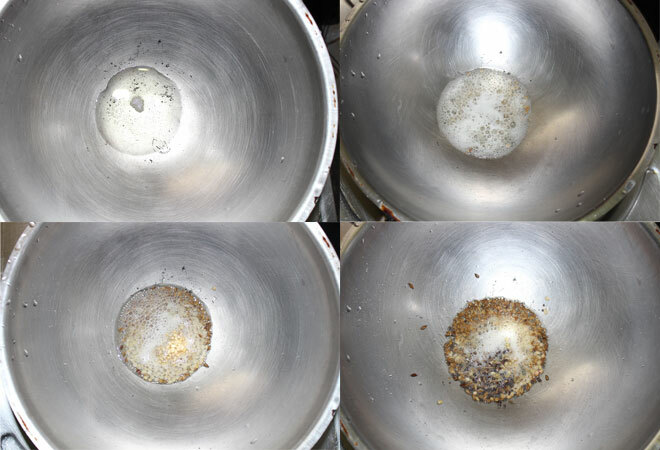 In a kadai warm a tablespoon of oil and add urad dal. Once it turns light brown, add cumin seeds and mustard seeds. Once the seeds splutter, add the chopped onion. Fry for a minute. Add chilli powder and salt and fry for another minute.